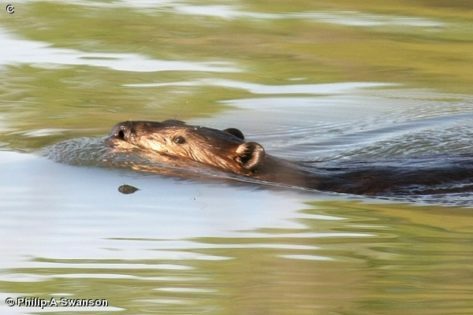 Beavers have large, scaly tails which make up about 15 inches of their total length of about 55 inches. They can weigh 50 pounds or more and live to about 10 years in the wild. They have a luxurious, brown fur which led to their virtual extinction from large parts of their natural range by trapping during the 19th Century. They have since recovered in many parts. 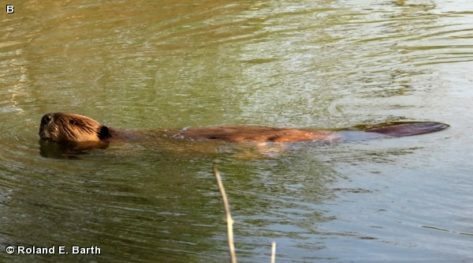 When swimming, Beavers look similar to the Muskrat, but Beavers show round ears, while Muskrats show none. 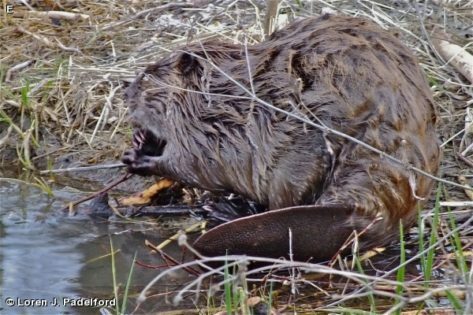 Beavers are mostly nocturnal and are most likely observed early in the morning. Although not often seen, their presence is verified by the stumps of the trees they have cut down for food. 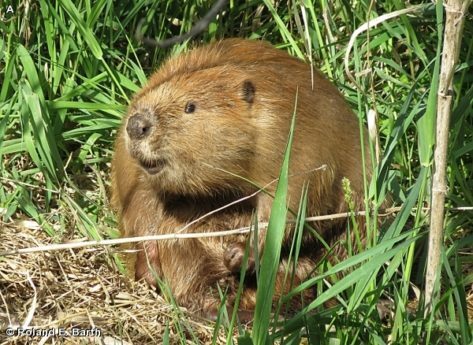 Beaver families reside in the Great Marsh, along Stream Trail, and Child’s Hollow in Fontenelle Forest, and in Rock Creek at Neale Woods. 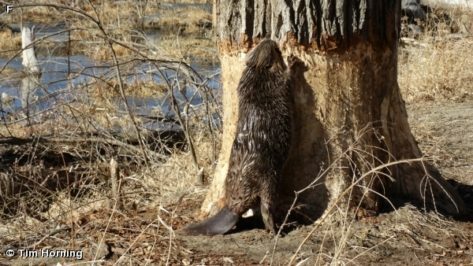 They periodically move to a different location when the habitat changes and no longer supports their winter food sources, mainly tree bark. 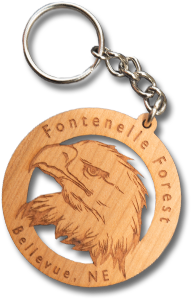 They build dens near water, where they also keep their cache of branches nearby for food during winter. 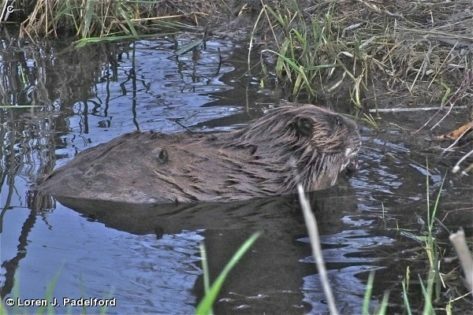 Beavers dam up streams to conserve water deep enough so it will not freeze completely during winter. 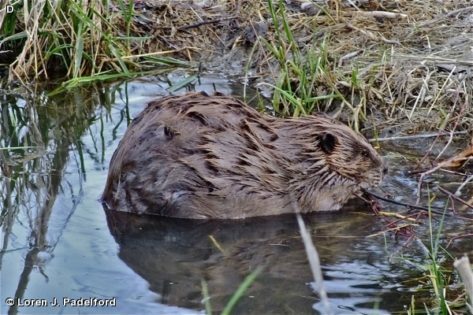 Beavers play a major role in changing the landscape of our floodplain and streams. 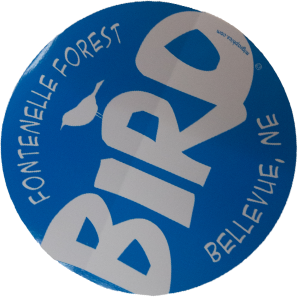 By cutting down trees and flooding areas as a result of building dams, they eventually turn floodplain woodlands into open marshy areas, as may be seen between Stream Trail and the railroad tracks in Fontenelle Forest.